February is right around the corner. Did you know that February is Dental Health month? I really enjoy teaching dental health in kindergarten because the kids really relate. Some students have already lost a tooth and most have already been to the dentist for the first time. I actually spend two weeks on dental health and have the nurse come in to talk to the students too. They love getting their own free toothbrush. I am really excited this year to try out this healthy snack found on Pinterest!! 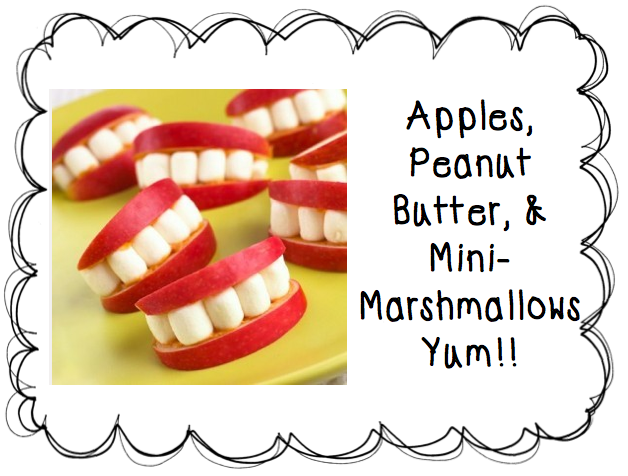 Apple slices, mini-marshmallows, and peanut butter..... What kinder wouldn't love this snack? Click the photo below to link to Pinterest. 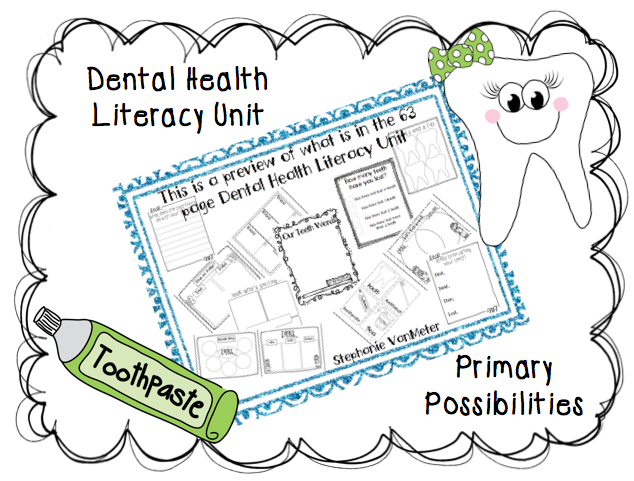 The Dental Health Unit that I mentioned is a 63 page unit filled with literacy ideas. The illustration below includes a few samples from the unit. Bare with me though, because I am offering a free download at the end of this post. I also came across this YouTube video to show my students. The tune of this song and video is perfect for my students. It will get them moving and so excited about learning. Another interesting site I found was at the Crest website. 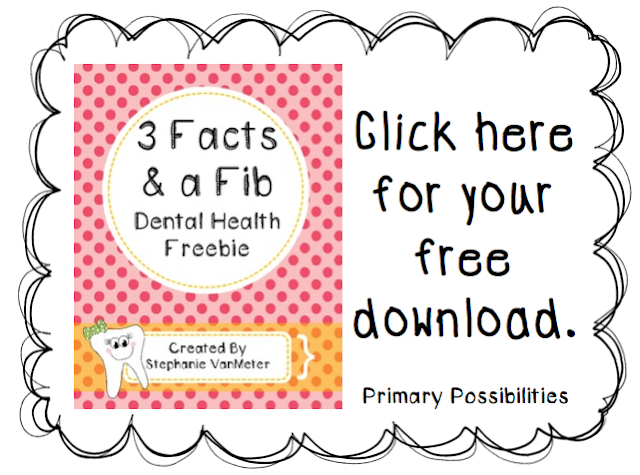 They offer student kits and teacher resources to help teach students about dental health. I even read that they will send a CD or DVD to help supplement your teaching. I have been told that Colgate also offers kits to teachers. I also think this Pinterest idea was super cute and so easy too. Now for the freebie!! I created a 63 page Dental Health Literacy Unit and have found it to be full of writing and integrating activities for my students. I enjoy the 3 Facts and a Fib portion of the unit the best. So, I am offering just that portion of the unit for free. I also used Stephany's fonts in the text boxes above. Click the photo below to check out her fonts. I love them!! 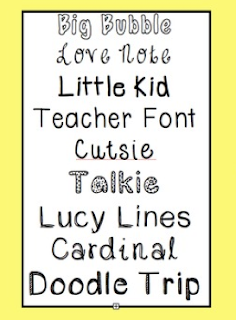 I used "Little Kid" and "Doodle Trip". February will be here before we know it. If you blog about either the Super Cute Fonts or the Dental Health 63 page Literacy Unit before February 1st, I will send you the Dental Health Unit for free. Just comment that you blogged about it, leave the link and your email too. The frames above were purchased from http://www.teacherspayteachers.com/Store/Teaching-In-A-Small-Town. I believe it is Colgate that sends free booklets, toothbrushes, and toothpaste. I just got my kit. Let me know if you want me to check out the website for you. I love that video! And every year, I have wanted to make those teeth snacks. This year might just be the year! *I am obsessed with those fonts! On my wishlist! Wow~ Great job! My mom is a hygienist and she always comes in for a lesson and activity and the kids get toothbrushes and toothpaste to take home. Your unit looks fantastic! The dental health are so important for the human. The dentistry treatments are so prevent with safely toxicity dental care. It concern with holistic health care. Thanks to share interesting information's. Choosing a healthcare provider is one of the most important decisions you can make. We are caring, knowledgeable, and accessible professionals, willing to take the time to go over all of your options and treat you as an individual, not just a patient. As a dentist in Michigan. we offer state or the art techniques, and the latest in dental technology supported by extensive continuing education. Your dental treatment system that you say is very effective, I think. You will be pleased to know that we have recently merged and acquired two beautiful dental practices, now Occidental. Thanks for sharing a great blog. The oral treatment is really appreciable because you have chosen good steps on it. I was looking for new teeth blog and after I have found so much information about this dental health. Thanks for all generated photos and informative stuffs. A good dentist is one of the best things you can ever do for yourself! Having a nice, reliable dentist that can do things like this is really important. Toothaches and unattractive teeth should not be overlooked. 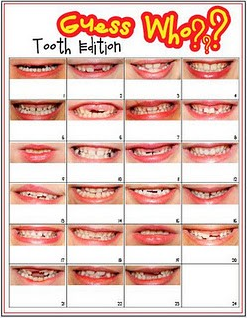 Very good stuff out there to show kids the importance of their dental health. I loved your art work and specially the apple jaws are so cute. Thanks a lot for posting it. The dental health are so paramount for the human. The dentistry medications are so anticipate with securely danger dental forethought.Thanks for sharing. I am very amazed by the information of this blog and i am glad i had a look over the blog. Thank you so much for sharing such a great information.